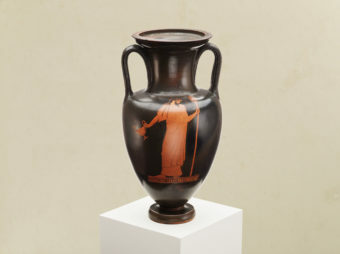 Kallos Gallery is a London gallery specialising in antiquities and ancient art. Based in Mayfair, we offer a wide range of antiquities, from ancient Greek art to Roman, as well as Egyptian, Middle Eastern and coins. Each artwork has been carefully chosen for its outstanding artistic merit, cultural significance, and provenance. Madeleine Perridge, the Gallery Director, joined Kallos in 2016 after more than a decade working with Antiquities and Ancient Art at a major London auction house. She read Classical Archaeology and Ancient History at Oxford University and has a Masters in History of Art from the Courtauld Institute of Art. She is a member of the ADA (Antiquities Dealers’ Association) and has been an independent expert adviser for the UK Treasure Valuation Committee at the British Museum. The gallery was founded by Baron Lorne Thyssen-Bornemisza, one of the world’s great private collectors of artwork from the ancient world. He funds several institutional archaeological excavations, and has endowed courses and research positions at Oxford University and the Open University, and numerous scholarships worldwide to broaden access to education about the classical world. Greek, Attic, circa 470 B.C. Münzen und Medaillen AG, Basel, Switzerland, auction 18, 29 November 1958, lot 118, pl. 38.